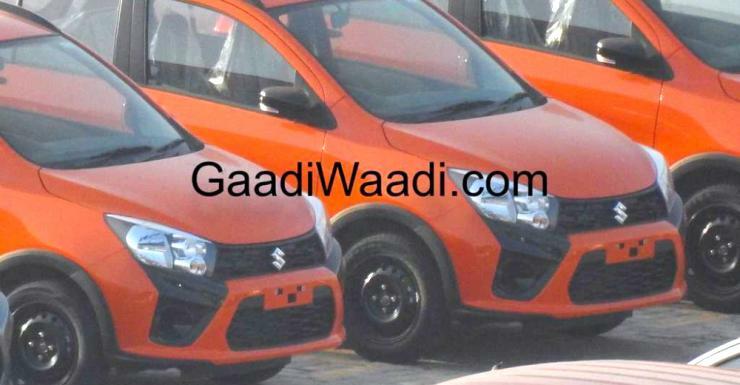 Maruti will soon launch the Celerio X. The car is a cross version of the popular hatchback. It has now been spied without any camouflage at a stockyard. This indicates that the car is just days away from being launched in India. Compared to the regular Celerio, the X model gets many styling changes. The front of the car gets a new bumper and grille design. The rear of the car also gets a new bumper design. From the spyshots, we can also make out that the car gets cladding that goes from the front bumper to the sides of the car and even covers the rear. The cladding has been added to make the car look more muscular. We don’t yet know if the ground clearance of the car has been boosted. Roof rails have been added and the tail lamps seem to have a new design. The hatchback lid also seems to be given a new design. Interiors of the car may not feature many changes. The engines and gearboxes also are expected to be unchanged. The Celerio is currently available with the 1 liter K series petrol engine. This engine generates 67 Bhp of peak power and 90 Nm of peak torque. It is available with two gearbox options – a 5 speed manual and a 5 speed AMT. Maruti also sells the Celerio with a CNG option. The same options may be retained in the X version. Prices of the regular model start from 4 lakhs. The X version is expected to be Rs. 30,000 costlier. The chief rival of the Celerio is the Tata Tiago. The Tiago is coming close to outselling the Celerio in India. This is one reason why Maruti is launching the X version. Bookings of this car will open soon. It seems to be ready for delivery as it has already reached dealer stockyards.